1. Bring a pan of water to the boil and cook the broccoli for 5 minutes then drain. While the broccoli is cooking pour the sherry vinegar into a small saucepan, bring to the boil, reduce by half and set aside. 2. Heat the olive oil in a frying pan with the sliced garlic. When the garlic starts to sizzle and just begin to change colour add the butter. When the butter is foaming, stir a few times then pour into the saucepan containing the reduced sherry. 3. To finish, toast the almond flakes in a dry frying pan till starting to darken slightly. Toss the broccoli in the sherry vinegar dressing. 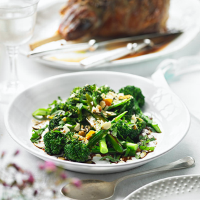 Scatter the almonds and parsley over the broccoli with a little squeeze of lemon. Season and serve.